(Notes on) Politics, Theory & Photography: "The photographer's desire for invisibility ..."? "The photographer's desire for invisibility ..."? I just bought (and started reading) Geoff Dyer's extremely engaging The Ongoing Moment (Pantheon). 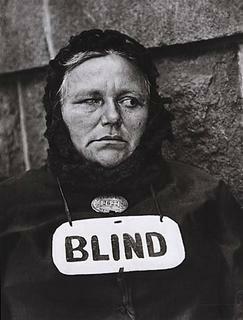 Dyer starts out discussing this famous picture by Paul Strand, "Blind Woman - New York, 1916." Dyer, I expect since I have not gotten very far in the book, aims to trace influences of old photos on more recent ones and, in the proce ss, to reflect on photography more generally. So here is something that Strand's photograph prompts him to say: "At the time Strand was preoccupied with the difficulty of how to use his bulky Ensign camera to take pictures of 'people in the streets without their being aware of it.' How do you make your subjects blind to your presence? This is another reason why the photograph is emblematic: it provides a graphic illustration of the photographer's ideal relationship to his subject." Dyer presents this image as the exemplar of Strand's pioneering techniques for taking photographs that capture people unawares - techniques that subsequent photographers have refined. "Strand had no qualms about this kind of subterfuge; it was only by deceiving his subjects that he could be faithful to them. 'I felt that one could get a quality of being through the fact that the person did not know he was being photographed,' he recalled. The blind woman is the most extreme extrapolation of this argument. The photographer sees his subject as she is unable to see herself. An unconscious embodiment or representative of the process whereby the photographer becomes undeeded, invisible, she is in turn a projection of his ulitmate ambition: to become her - and the world's - eyes" (12-13, stress altered). Now, I am unsure whether Dyer is endorsing this notion that invisibility is the photographer's ultimate ambition, or whether he is simply interpreting this as Strand's project. But it seems implausble to make this a general claim. Here I would contrast, for instance, Jerry Thompson's discussion in his Truth and Photography (Ivar Dee, 2003) of Walker Evans' famous portrait of Allie Mae Burroughs. Thompson speculates on the probable tensions involved in the interaction beween Evans and Burroughs as he, working with unwieldy equipment, tried to keep her, uncomfortable and so, tacitly at least, resistant, in place long enough to take a series of closely framed close-up shots of her. In what sense can we accommodate the interactions this episode exemplifies (Evans apparently is something of a hero to Dyer) into the view that the general quest of photographers is for invisibility? The discussion here opens up a pretty obvious ethical tension at the intersection of truth and photography: if someone like Strand might say that in order to reveal the truth of a person's being in the world to viewers, photographers must be willing to deceive their subjects, how do we assess truthfulness in photography? describes the scratch but not the itch"
Embeddedness: In the Eye of the Beholder?